With Readly you can read Money Manual and thousands of other magazines on your tablet and smartphone. Get access to all with just one subscription. New releases and back issues – all included. 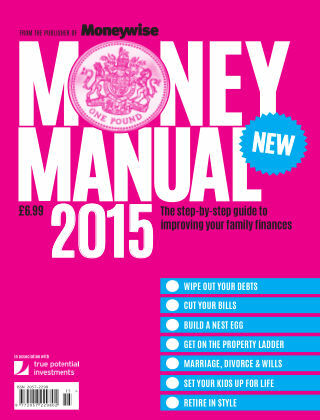 Written by Mark King and Laura Whitcombe, Editor and Deputy Editor of Moneywise, the Money Manual for 2015 is all you need to help keep your finances fit and your wallet bulging. The guide is packed full of unbiased, jargon-free advice: from opening your first savings account to buying a home, protecting your family and preparing for retirement. It's the must-have guide for everyone in your family whether you're having a baby, getting married or looking to retire in 2015. Learn how to: * Clear your debts, budget effectively, build up a savings pot and start investing * Understand which products are right for you and your family - and which to ignore * Buy and sell property - whether you're a first-time buyer, moving or downsizing * Secure your family's financial future with money-saving tips, cost-cutting ideas and help.